We speak to industry stakeholders and experts for their thoughts on what lies ahead for the film industry in the coming twelve months. South Africa has remained a resilient film and television industry despite numerous setbacks in the last twelve months and beyond. Although the country is still not out of the woods, it has stayed the course and will no doubt come out stronger for it. A softcore recession, political instability and an upheaval of the rebate system are just a few of the reasons why the industry has struggled, added to the fact that new international destinations such as Eastern Europe and Mauritius have opened their doors for film business, offering competitive rebates, cheaper labour, and other attractive options for the global industry. The Western Cape, too, has dealt with a serious drought, and despite the downturn in 2017/18, is bouncing back with a number of international clients shooting in the region this open season. “Going out of drought is helping manage a more positive message including that we are a resilient city and region,” says Monica Rorvik, Head of Wesgro’s Film and Media Promotion Unit. 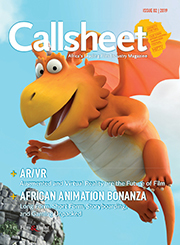 Continue reading in Issue 1 of Callsheet by clicking here. This month we explore the african animation bonanza, as well as augmented reality, virtual reality and the effect it has on the future of film. SIGN UP BELOW FOR THE LATEST NEWS, DEALS AND PROMOTIONS DELIVERED STRAIGHT TO YOUR INBOX. IF YOU WOULD LIKE TO ADVERTISE IN OUR MONTHLY MAGAZINE. DROP IN YOUR EMAIL AND ONE OF OUR BRAND MANAGERS WILL CONTACT YOU SHORTLY.